Most of my life I’ve been a fan of strategy games – Risk®, Age of Empires, even Checkers. These games all demand that the player has a solid strategy, or they will likely be defeated by their opponent. Anyone playing without a strategy is just executing random actions based on feeling or intuition (or luck), without a plan, and more often than not, won’t even see their defeat coming. In my experience, the words “strategy” and “tactics” always lead to a great conversation. In one of my previous places of employment, there was so much pressure to be “strategic” that the words strategy and strategic became overused and meaningless – everything was presented as a strategy because that was the perceived path to promotion. Telling someone that their “strategy” was actually tactical execution would lead to heated debates. I have seen people ask for strategy documents and then criticize them for their lack of specifics (which was code for ‘where are the tactics?’). The word “strategy” is derived from the Greek word strategos, meaning the “art of the general.” Simply put, a strategy is a plan to enable you to achieve a desired result. For a military general this is their plan for how they will deploy troops and resources. Conversely, tactics are the specific actions that will be executed to achieve the plan, such as flanking a building in our example. In a previous post I explains how a Vision sets the overall direction; it is the compass for an organization (or even an individual). With a defined vision you can define the strategies that will enable the vision to become reality. Only once you have defined one or more strategies can you define the tactics that will be used to achieve the strategy (thereby achieving the vision). Take for example a person with high cholesterol who has a vision of being healthy. Their doctor may recommend several strategies for them to bring their cholesterol down and help them achieve their vision of health. One strategy might be to manage weight and/or drive weight loss. Another strategy might be to create a more healthy lifestyle (Note: these are simplified for the purpose of discussion). Each strategy will be achieved by executing a set of tactics, such as engaging in 30-minutes of cardio exercise 3-days a week by running or swimming, or by reducing the amount of animal fat intake, by having vegetarian meals a couple days a week. The difference between strategy and tactics is the difference between a plan and an action. A strategy is the plan–an adaptable plan–for how you will achieve a goal, and the tactics are the executable actions you will perform to achieve the result outlined by the strategy. In military usage, a distinction is made between strategy and tactics. Strategy is the utilization, during both peace and war, of all of a nation’s forces through large-scale, long-range planning and development, to ensure security or victory. Tactics deals with the use and deployment of troops in actual combat (Dictionary.com Unabridged. Based on the Random House Dictionary). Strategy and Tactics are the plan and the actions. Creating a strategy, whether for a business, product or person, begins with the Vision; how can you create a plan without a vision of what you want to be when the plan is achieved? Assuming you have a good, concise and specific vision, then defining the strategy or strategies you will use is an exercise in planning. Start by identifying what has to happen in order to make the vision a reality. In the example of the person with high cholesterol who has a vision of being healthy, what has to change is their cholesterol level. Manage weight and/or drive weight loss. Improve lifestyle health (e.g. eating, habits, etc.). With one or more strategies identified you can begin to evaluate them and decide which ones you want to employ. Our example patient may not want to introduce medication at this time, and will commit to the first two strategies. The strategies offer measurement milestones to determine their effectiveness, such as annual physical examination. The measurement milestone is designed to identify if the strategy is working, or if a new strategy is needed. One of the most critical elements to a strategy is the ability to measure its effectiveness. You don’t want to continue burning resources executing against a strategy that isn’t working. With each strategy you identify you must identify a means to measure its success. For example, when we were preparing the initial beta release of Icenium we wanted to attract net-new customers to the company. One of the strategies we developed was to drive awareness through trade press that targeted audience profiles that were different than the current customer profile at the company. We developed a couple of measuring sticks. When we created the beta release plan we decided that we would allow new users into the system through an invitation code (so we could control the inflow), and to aide the strategy we negotiated an exclusive announcement of the beta (with a couple thousand beta codes to giveaway) with TechCrunch, a publication that targeted the type of user we were interested in. 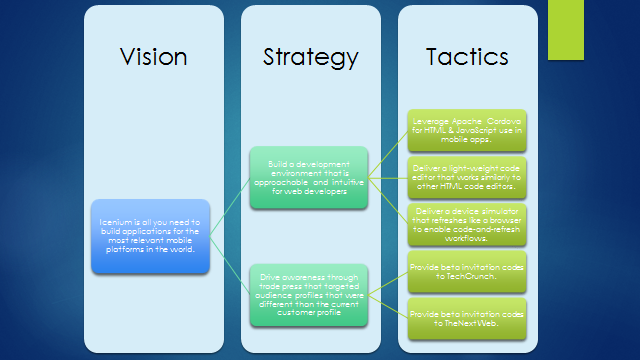 This tactic was designed to support the higher level strategy of driving awareness to new user profiles. Within our system we created a reporting mechanism that would tell us the number of people responding to the invitation who were using email addresses already in our customer database. While not foolproof (because people have multiple email addresses), this did give us a good indication about the number of net-new customers we were bringing into the system, and since they were tied to their invitation code, we could tell where they came from. As we added more press outlets, and gave out more invitation codes, we could tell if our strategy was working or not by evaluating the percentage of net-new users coming from specific trade press. In other words, we defined strategies that would help us achieve the vision, and identified specific actions, or tactics, that would help us execute the strategies. The measurement sticks we created were less analytical and slightly more subjective – a review of support issues, overall community tone about the product, and a survey of users after they had used the product. We even ran a survey of users that abandon the product to find out why they left us (was our strategy failing or were they the wrong user profile?). As you may have realized from the examples, a good strategy doesn’t have a lot of specifics about the actions. In fact, a good strategy should be adaptable to start or stop using specific actions, or tactics, at any time. A strategy for managing cholesterol doesn’t specify jogging or swimming, it identifies an amount of cardio recommended to achieve the desired result. If the patient executes the strategy with jogging, and either doesn’t like it, or gets injured, the strategy is flexible enough to allow them to introduce an alternative tactic—swimming—that is still in line with the strategy. Strategies are all about what you can do at a conceptual level – a planning level – to achieve your vision, and the tactics are the specific execution – the specific action – you will take to fulfill the strategy. All too often we see people executing with no idea of the over arching strategy. This is when motion is confused with progress. Executing tactics without a strategy to drive them is simply motion. It’s business masturbation. You’re very busy, but nothing useful is going to result from all the effort. I personally put a huge value in companies and organizations that measure result instead of action; those that value what is accomplished instead of how active people are. You can identify these companies by who is getting rewarded and promoted – is it the people who are thoughtfully developing a plan and executing methodically against it, or is it the people who are very busy with projects that look good, but drive no real measurable advancement toward the vision? As a Product Management professional I feel strongly that my value is in being able to define a product vision and a set of strategies that will make that vision a reality, and then identifying tactics that I, or others, can execute to fulfill the strategy. More often than not, the execution is done by others, by the troops (engineering, marketing, sales, support). For my product I am the general, and the product strategy is my art. Today I am proud to announce the first update to Icenium since our v1 launch a month and a half ago. As a cloud-based solution, we have always planned for a regular cadence of product and service updates – continuous delivery of value, if you will. This v1.1 release represents our first step toward establishing a regular cadence of updates that include new features, improvements in existing features and fixes for any issues discovered (thank you for reporting them to us in our forums). As we continue to develop Icenium, we expect to deliver updates on a regular schedule, starting at about every 6-10 weeks, and eventually accelerating to where we can deliver product and service updates at high frequency. 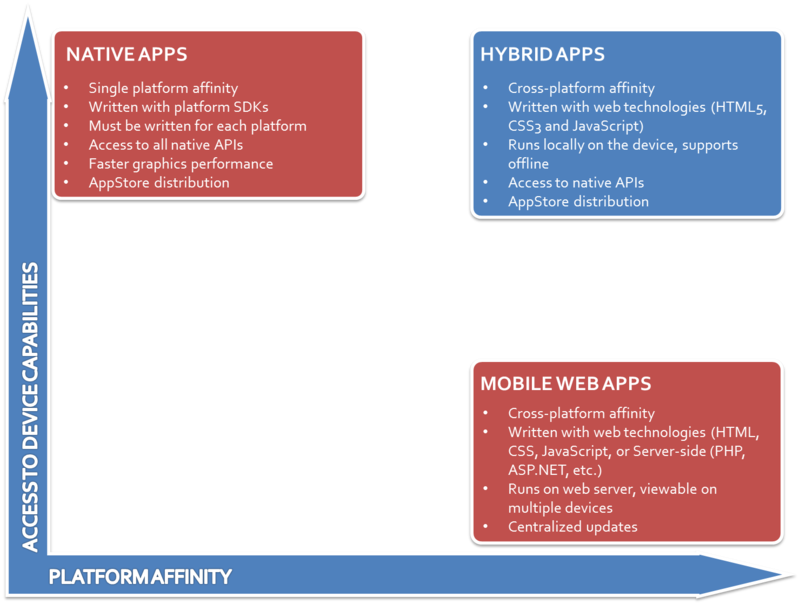 General – Changes and updates to the back-end services, or changes that apply to all client tools. 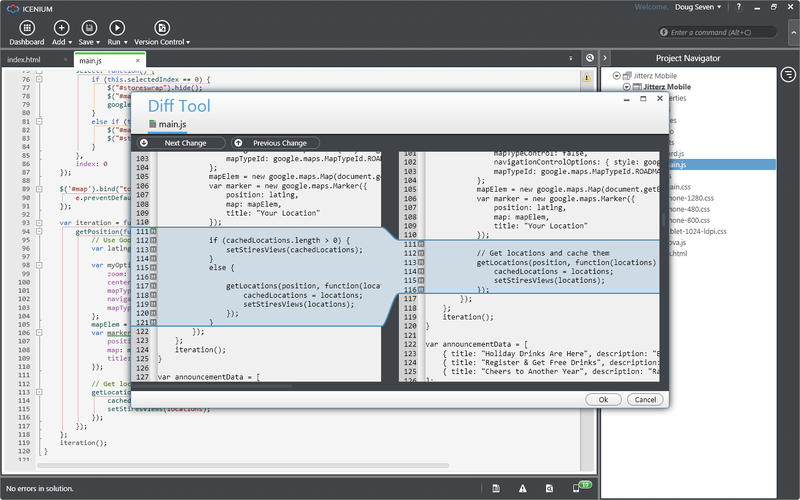 Icenium Graphite – Changes and updates to the installed client for Windows. Icenium Mist – Changes and updates to the browser-based client for all platforms. 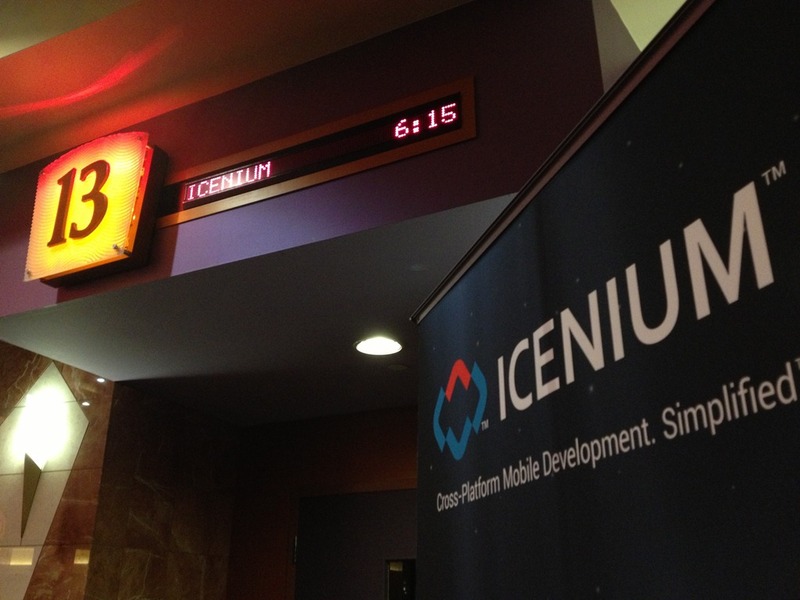 Icenium Ion – Changes and updates to the iOS development and testing utility. 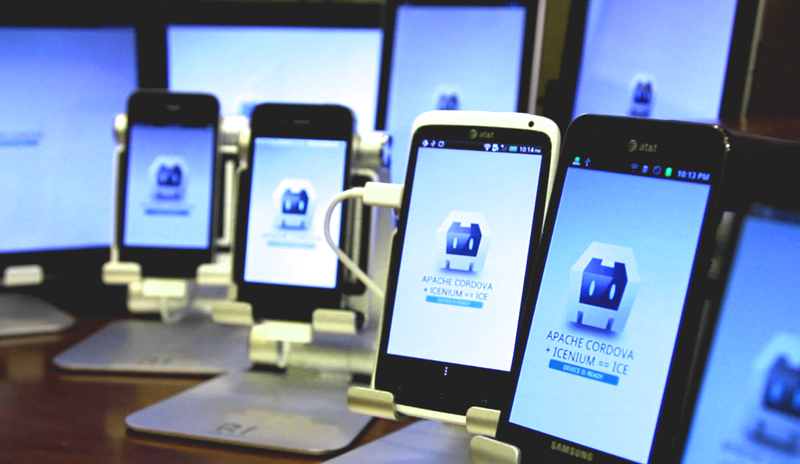 All Icenium projects may now use Apache Cordova 2.2. 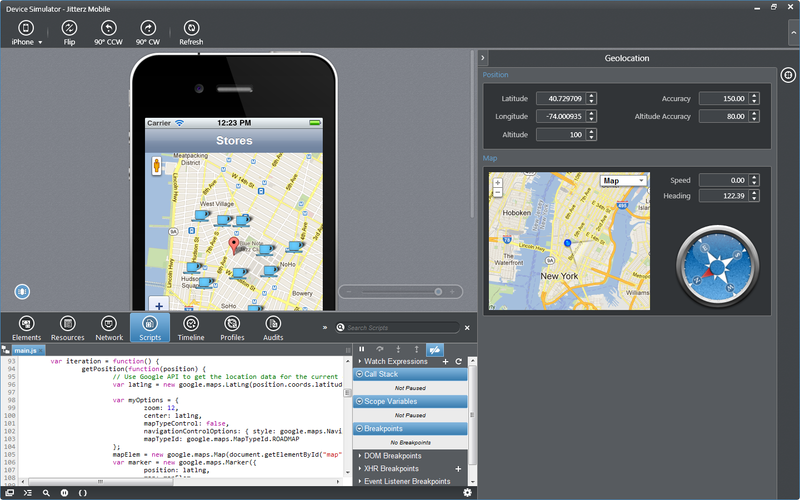 All new projects will be created using Cordova 2.2 by default. Existing projects can be upgraded to the new version in by opening the Properties settings for a project. The ChildBrowser plugin has been updated to version 4.0. This version is compatible with Apache Cordova 2.2. 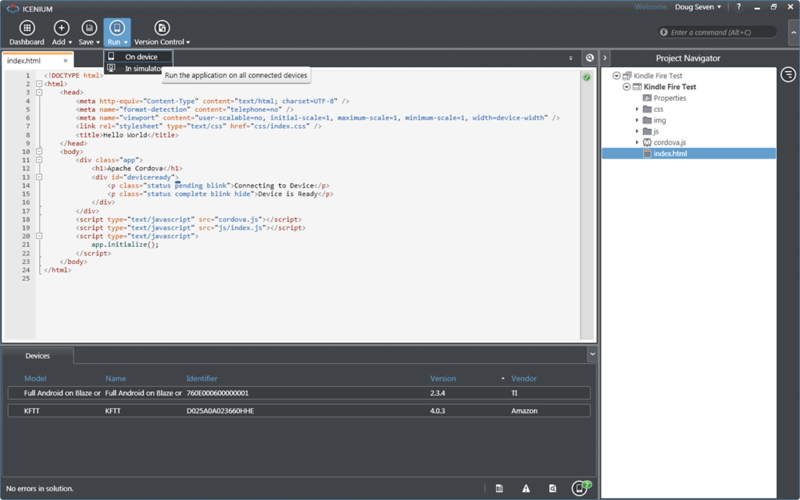 The new project template (Kendo UI) has been updated to use Kendo UI Mobile v2012.3.1114. The new project template (jQuery) has been updated to use jQuery Mobile v1.2.0. In the project properties you may now select to enable or disable Android hardware acceleration. 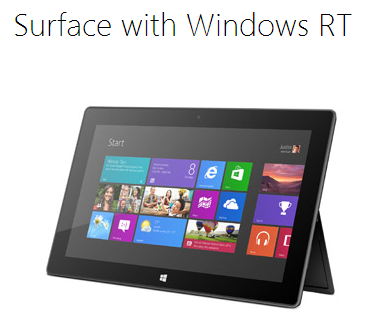 Hardware acceleration will improve the rendering of UI animations. OS Version Support in Device Simulator. OS version selector has been added to the simulators. 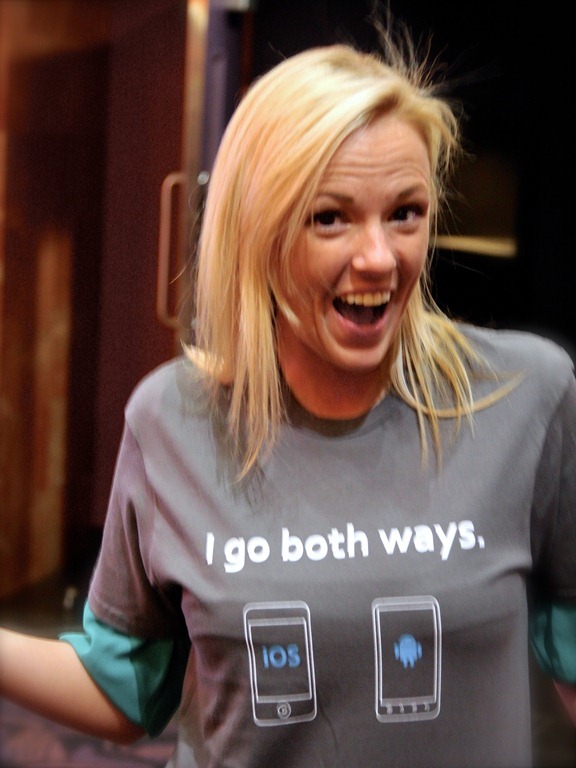 Changing the OS version can affect behavior of the app. 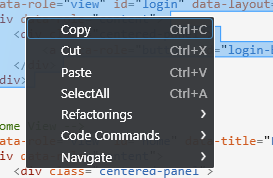 Cut, Copy, Paste, and Select All commands have been added to Code Editor’s context menu. New ‘Reload’ button in the device simulator reloads the current project. 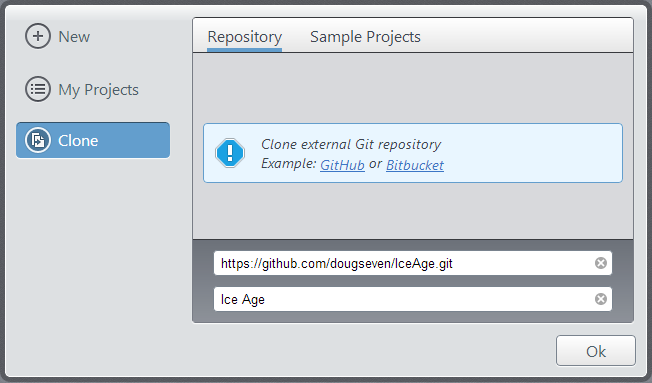 The version control capabilities of Mist have been improved to parity with Icenium Graphite, including the ability to Clone projects from a URL-based Git repository, such as GitHub, and push and pull changes to and from the parent repository. A keyboard shortcut (CTRL+F) will open a Find dialog enabling you to search code files for specifies text. Additional shortcuts have been enabled during Find operations – Find Next (Enter or F3), Find Previous (SHIFT+Enter or SHIFT+F3). 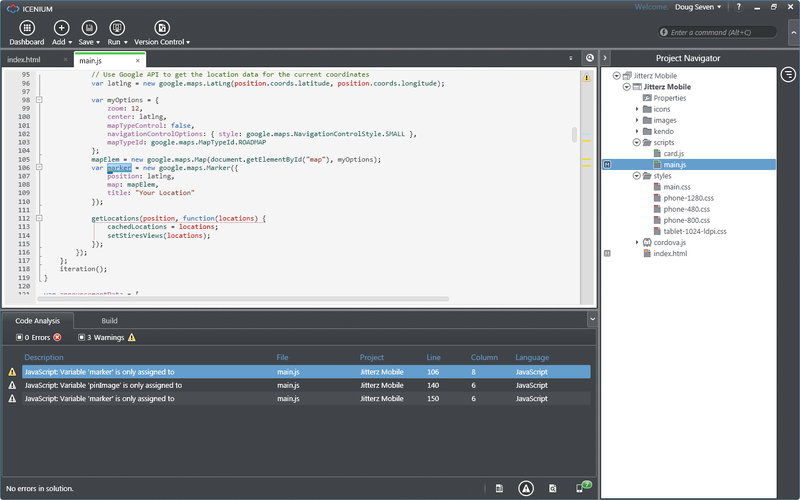 Case-sensitive search and search with RegEx are supported. When RegEx search is enabled case-sensitive search is disabled. Status bar and orientation properties have been added to the device simulator. When a CORS request is executed via the device simulator an information message is displayed letting you know what is happening. Ion works with Cordova 2.2 only. A warning message is displayed when attempting to use older versions. 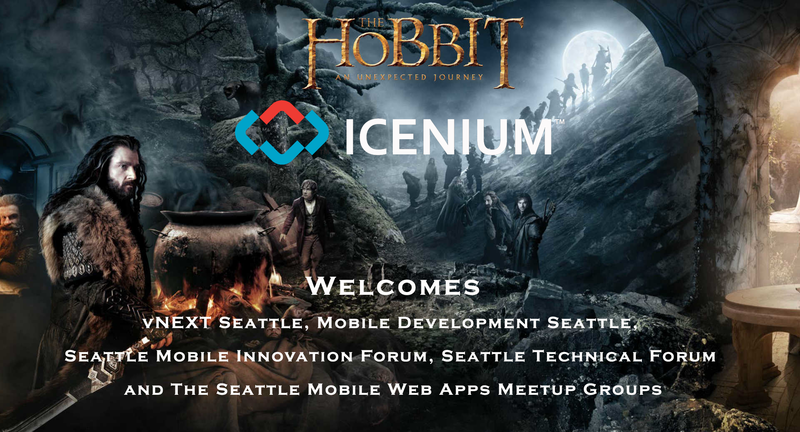 Last night I had the great pleasure of introducing a few hundred mobile app developers to Icenium, and then treating them to a pre-release private screening of The Hobbit: An Unexpected Journey in High Frame Rate 3D. I have to say, I had a blast. The energy level was high, I meet a lot of very cool, developers, and learned a lot about some of the start-ups in the area. 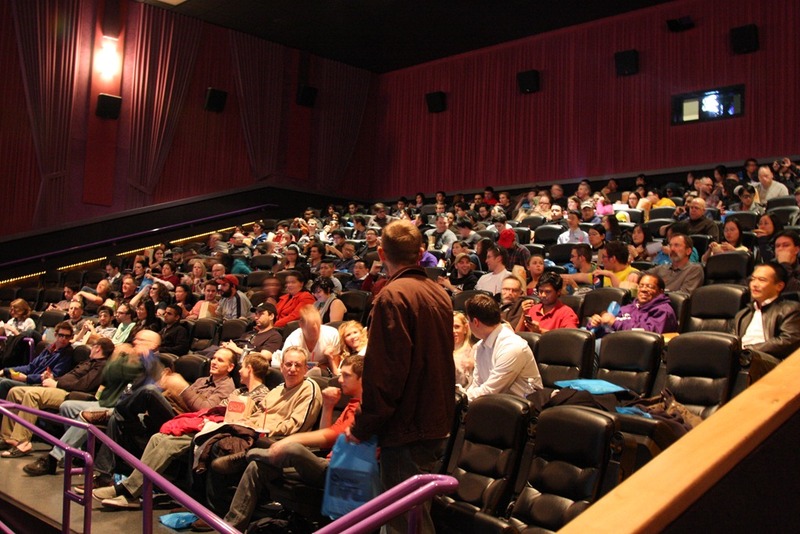 From talking to lots of you as you were coming out of the theater, it sounds like the movie was great – especially in HFR 3D (Sony was onsite ensuring the 4k projectors were in top shape!). Thanks again for attending – see you next time! Since we released Icenium a couple weeks ago, a few folks have asked me if it could be used to build apps for the new Kindle Fire HD. The simple answer is “Yes.” The Fire HD is an Android Ice Cream Sandwich (v4.0.x) device, and Android (v2.2 and greater) is a supported operating system for Icenium projects. In order for Icenium to communicate with devices over USB, and deploy and update apps, the device drives for those devices have to be installed and configured on the PC. For Apple iOS devices, the device drivers are included in iTunes. For Samsung devices, most of these are in Samsung Kies. 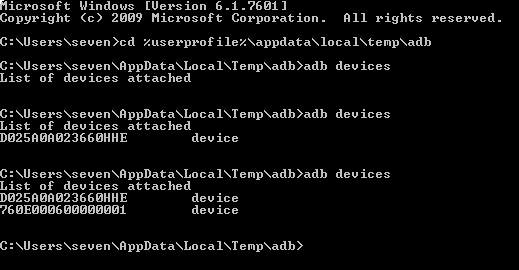 For HTC devices, these are in HTC SyncManager. You get it. But what about Amazon? They don’t have a utility like this. Setting up the Kindle Fire (1st Generation) to work with Icenium LiveSync was pretty straight forward – download the USB driver, update an INI file and wham-o, it works. Then Amazon released the Kindle Fire HD, which included an updated operating system (the original Kindle was based on Android Gingerbread – v2.3.4) and it was proclaimed to be unhackable. This meant that for developers it was going to be a challenge to work with it as a development device in any way not prescribed by Amazon. 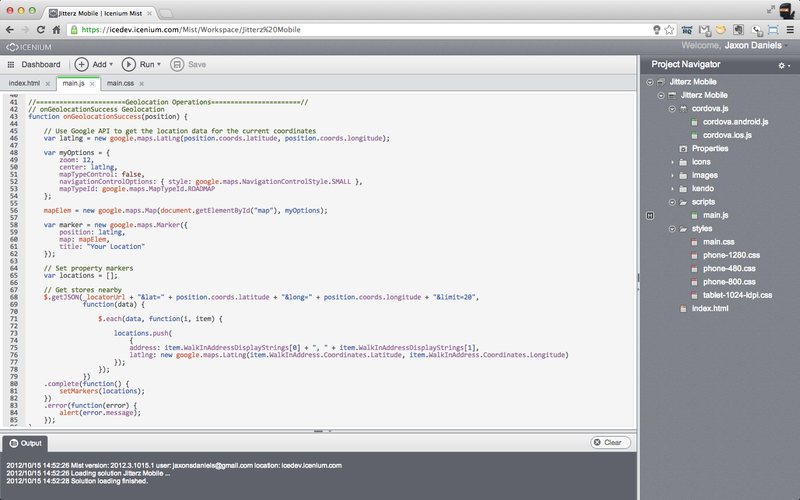 Of course the official guidance is to use the Android SDK, platform tools and Eclipse as your development environment. Yuck. When you plug in a Fire HD, it installs a driver that enables you to copy media files to and from the device, but it doesn’t enable the Android Debug Bridge (ADB) to access the device to install apps. Icenium LiveSync uses ADB for the communication to Android devices to enable deployment and updates on devices (don’t worry, you don’t need the Android SDK for this, ADB is installed in C:\Users\<usernmae>\AppData\Local\Temp\ when Icenium Graphite is installed). I bought a Kindle Fire HD 7” and began following the unofficial steps to connect to it as a development device. Turns out it was very troublesome, especially if I refused to download the Android SDK. I found a few blog posts that all pointed back to a forum post on how to root the Fire HD, so I gave it a shot. Unfortunately for me when I followed the steps it didn’t work. No matter what I tried, the correct driver would get installed, and the Fire HD wouldn’t show up in the ADB device list. Rather than get discouraged, I experimented and got it to work. The steps in the forum post may work for you, but they didn’t work for me right away. The only ADB driver that I could get to install was the Android ADB Interface (not the Android Composite ADB Interface driver as outlined in the forum post). I had to manually install a different driver (a generic USB Composite Device driver), and then the Kindle Fire HD was recognized by ADB. After that, I connected the Kindle Fire (1st Gen) that I previously had working, and the Android Composite ADB Interface driver magically appeared. I disconnected both Kindle devices and reconnected them and both of updated to the Android Composite ADB Interface driver. 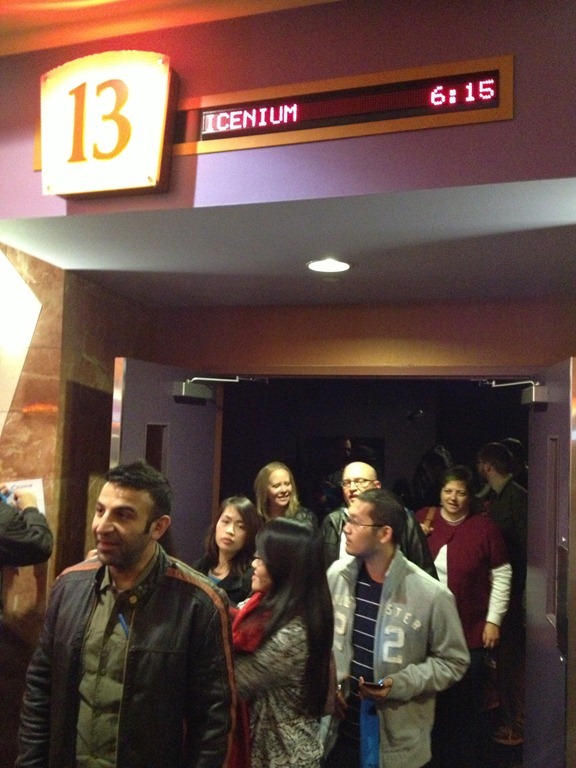 …which meant that both devices are ready to by used by Icenium LiveSync. 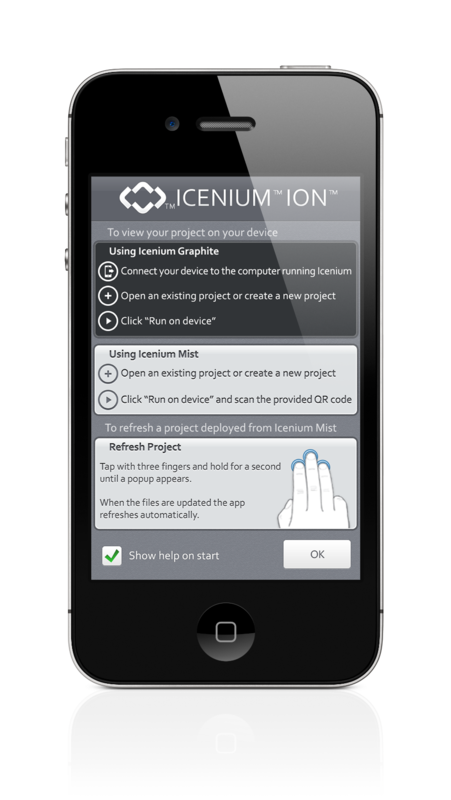 Now when I click on “Run on Device” the app is compiled in the cloud for Android using the Icenium Compiler Service and pushed through Icenium Graphite and over ADB to the devices. That’s it. 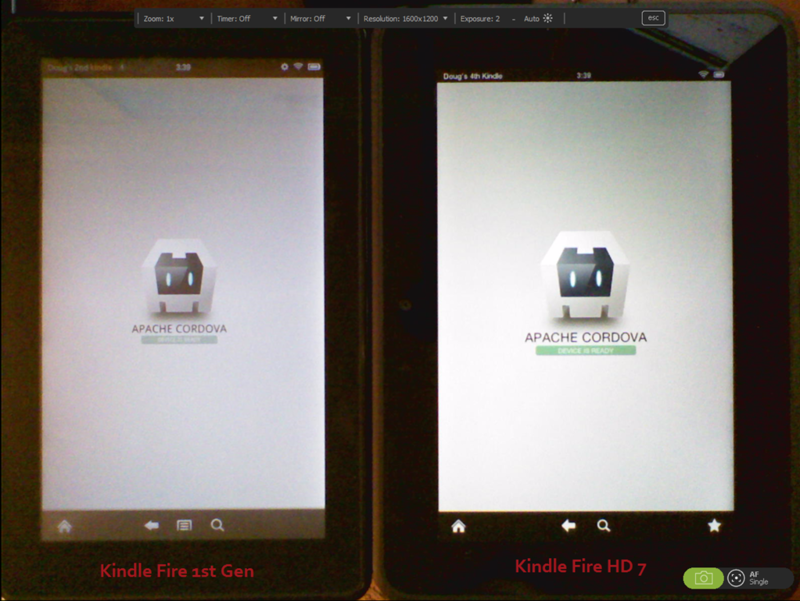 Now you can test your Icenium project on either a Kindle Fire or Kindle Fire HD. As soon as the Fire HD 8.9” arrives, I’ll give that a test. And stay tuned for a video series on Icenium LiveSync called “Getting to 50’ where I will add various devices to see if we can successfully support simultaneous LiveSync to 50 devices.